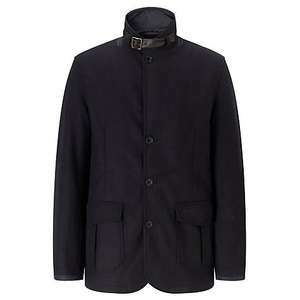 Barbour Barkston Military Jacket, Navy only S and L sizes left £124.50 @ John Lewis. Reduced from £174.30. Free delivery. This stylish jacket from Barbour will undoubtedly add a new dimension to your outerwear wardrobe. The military jacket sports leather elbow patches, comes in a tailored fit, button fastening, two front pockets and is made from a wool-rich blend. Other Barbour Jackets are also on sale but stock and sizes are limited.